The RSPB announced today that a young male Hen Harrier, fitted with a satellite transmitter as part of the Hen Harrier LIFE+ Project, has gone missing on a grouse moor in the Monadhliath Mountains, south-east of Inverness. 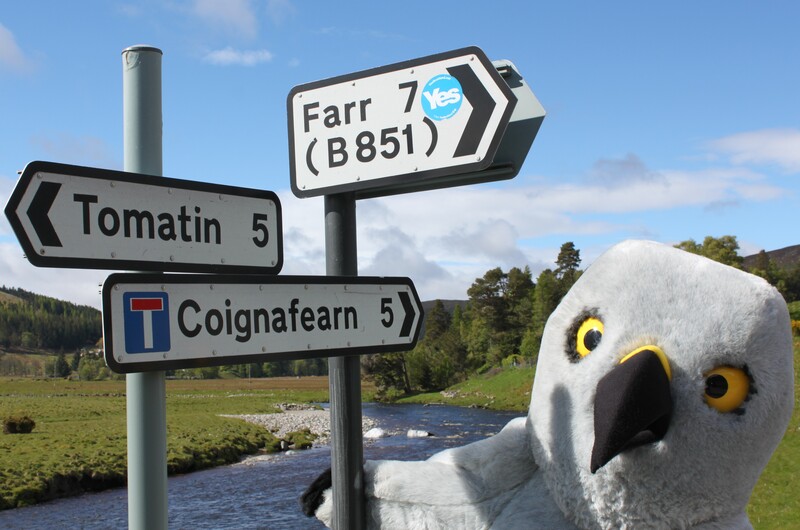 The bird, named Elwood, was the only chick to fledge from a nest in Banffshire, which was being monitored under the Partnership for Action against Wildlife Crime Scotland ‘Heads-up for Harriers’ scheme. 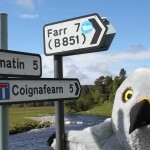 The transmitter’s data, being monitored by RSPB staff, indicated that Elwood fledged in the first week of July, but stayed close to the nest site in the hills above the River Spey until 20 July, when he began to travel more widely. By the 27 July, Elwood had moved 20 miles to the south west, and had settled in the hills around Tomatin. Elwood remained in this area, with the transmitter providing detailed information about his daily travels until suddenly, transmissions ceased abruptly on 3 August. His last recorded position was on an area of managed moorland a few miles from the Slochd summit on the A9. Ian Thomson, RSPB Scotland’s Head of Investigations, said: ‘This latest disappearance of a satellite-tagged bird is deeply concerning, and joins the long list of protected birds of prey that have been confirmed to have been illegally killed or disappeared suddenly in this area. The transmitters being fitted to these birds are exceedingly reliable, and illegal persecution is therefore the most likely explanation of the disappearance of these birds of prey. The absence of typical breeding raptor species from areas of suitable habitat, or at traditional nesting sites, in large parts of the Monadhliaths is further supporting evidence of a major problem with wildlife crime in this general area. This case is all the more depressing as the nest from which Elwood successfully fledged was monitored as part of a partnership project between PAW Scotland and the local landowner. It proves, yet again, that despite there being a good number of enlightened estates who are happy to host and protect nesting birds of prey – as soon as they move away from these areas they are being illegally killed. The denials and obfuscation from representatives of the land management sector, and their consistent failure to acknowledge and address this problem, is one of the main reasons why our bird of prey populations are struggling in the central and eastern Highlands. We repeat our call to the Scottish Government to introduce a robust system of licensing of game bird hunting, where the right to shoot is dependent on legal and sustainable management of the land, in line with approaches adopted in most other European countries.‘. One disappearing satellite-tagged protected raptor disappearing suddenly over a grouse moor is suspicious – the more that disappear, the more suspicion turns into certainty. Add in those we know for certain were killed deliberately, and it adds up to a damning indictment of the way that driven grouse shooting is carried out in the UK. Driven grouse shooting depends on big bags of birds, a high kill rate, and cannot afford to let raptors survive, even though they are protected by law, and have been all your lifetime unless you are a bit older than I am. 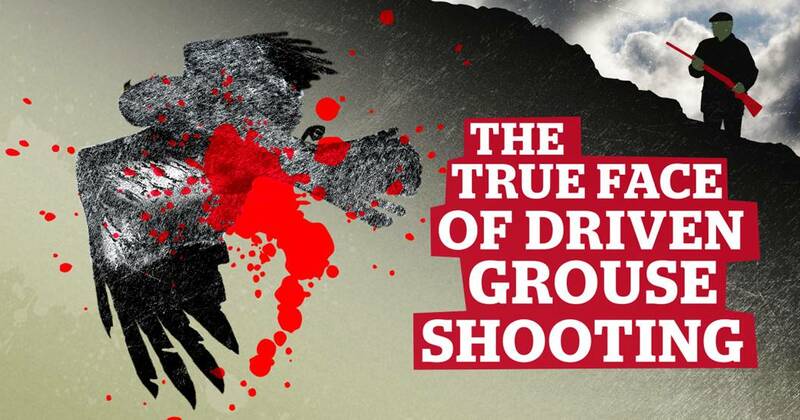 Generations of birds of prey have been subjected to systematic, routine and ruthless illegal persecution because people want to shoot Red Grouse for fun. The RSPB wants grouse shooting to be better regulated – I’d like to sweep it away altogether through a ban. If you agree with me, and I think most Hen Harriers and Golden Eagles would, then please sign here to add to the strength of our voice as we head to a debate on the future of grouse shooting in the Westminster parliament. We’ll see what that comedy double act of McAdam and Baynes have to say this time – it sounds as though the RSPB expects more denial and obfuscation from shooters. I'd like to express my heartfelt thanks to the grouse moor owner near the Schloct summit for exposing once again the arrogance that lies behind the grouse shooting industry. It is just a pity that each time they are shown for the criminals that they are that hen harriers die, expensive tags are destroyed, the many hours of RSPB and volunteers time are wasted and the hopes of enlightened estates are so cruelly dashed due to the lack of action by the Scottish government. Alex - of course we don't know for certain what happened, and we certainly don't know who was responsible. I actually thought the interview was not too bad. Of course the RSPB (actually RSPB Scotland interviewed) have to maintain an element of conservation organisation stuff, but in balance, for the BBC, it did mention persecution, the problems with bringing folk to justice and the differences between England and Scotland where vicarious liability is an option. I wouldn't be quite so critical. However, I do think we should stop simply saying "it's difficult to prove these crimes" as proof of systematic criminality is clear and abundant, it's only bringing the culprits to book that's hard. Since everyone now knows that a debate is in the offing, wouldn't you expect them to lie low for a bit?? Not very subtle are they. Complete arrogance born of knowing that the ruling class is on your side. 4. simply that they they continue to believe they are untouchable? My gut feeling is that it is a combination of sheer arrogance and a long-term conservative culture that resists change of most kinds. Added to this is probably now a refusal to back down ('compromise') as this would be viewed as conceding defeat, which is an anathema to them. So in doing so, they have effectively condemned driven grouse shooting, and perhaps the wider shooting industry to a change which may go further than what could have been, if they genuinely engaged with the process. The debate, assuming it happens will move the conversation to Westminster and legislators and policy makers. Legislators and policy makers are not generally keen to be seen, heard (or subsequently read) to back criminality; so whilst there will be support for the shooting lobby from MPs, their support may be cooler in the public debate than behind closed doors - but this will be the public record and their public record. Which is why writing to our MPs is now so important - it is underpinning and asserting the petition. In my view, MPs generally listen to the public mood more so than individual lobby groups - viz a viz 'the expenses scandal'. Last year both a red footed falcon and a little bustard were found shot. General vandalism or were they specifically targeted because they were important to birders, both twitchers and general bird watchers? The venom, lies, rambling nonsense, misinformation and dirty tactics directed at the conservation sector is shocking, has been for years and is now getting far worse and increasingly blatant. If a constructive comment gets posted by a keeper it's either done anonymously or it's ...from an ex keeper, the good ones are out of place. Some years ago in Scotland in the same summer two apprentice keepers were convicted of serious animal cruelty - one in Glasgow for kicking a hedgehog to death, another in Broxburn for participating in badger baiting. Two in one year from what could not have been a huge pool of apprentices - says an awful lot. A very scary and spiteful lot who will bring about their own downfall, but as Alex says a lot of misery to innocent parties too. Can't be too quick in consigning driven grouse shooting to history. I do think that there's a subtle change in the language used by the RSPB in reporting this. There's no equivocation in stating the reliability of transmitters and the cause of this bird's disappearance, pointing the finger firmly in the direction of the grouse moor business. I agree with you, Paul - it is an extraordinarily arrogant action and one which needs to be publicised as widely as possible. I see the deniers are out in force on social media. But I do wish those on our side wouldn't match invective with invective. Completely counter productive! Interesting that this has been covered on Today programme - evidence of this issue being higher up the agenda than even a few weeks ago? I was vaguely watching the numbers last night, but when I saw a 'jump' I started paying attention, and taking notes, mindful of Marks posts, a couple of days ago. That's interesting - it's now on 114,600 but has dropped out of the 'top three', (so below 116 per hour which is the rate for the current third most popular, the petition about the Bank of England and QE). I did a series of continuous screen refreshes after posting the above - the number would remain unchanged for four or five refreshes and then jump by two signatures, pattern repeated over a couple of minutes. I'm in no position to know whether this is or isn't suspicious but it did seem noteworthy. In the time it's taken me to type this it's added 12 signatures, so I guess this morning's excitement could have been a jump due to reporting of the HH disappearance or some other email or newsletter. No doubt if it's a bot the total will drop again at some point this afternoon when the petition website people do their good work. I've said it before and I'll say it again - I'm sure that many people will know the perpetrators of this type of wildlife crime, even knowing the person who has destroyed Elwood, but without the evidence cannot serve justice. Maybe it's time to have people on the ground the tagged birds are inhabiting, permanent watch-outs keeping an eye on the tagged birds and the people who set out to destroy those birds. Let those destroyers of our natural heritage know that they are being watched 24/7. Maybe all that is already happening? Well if it is happening then it isn't working. Andy - they fly around a lot, do birds. Tagged young Golden Eagles can cover what amounts to the whole of Scotland in a few weeks and they don't tell you where they are going next. Fair enough Mark. What I should have said was that if a tagged bird is shown to be spending time in a known raptor 'death trap' area then it would be good to have surveillance in place. I know it would be a long shot but to catch just one person in the act of raptor persecution would be a real coup for the call to ban driven grouse shooting. The best solution I've seen, albeit tongue in cheek, was over at RPUK today which was to tag the birds AND the gamekeepers! Tongue in cheek? Many a true word offered in 'jest'? Today's comment on RPUK isn't the first time the suggestion has been made either. Another option might be to create some kind of App for their mobile phones or radios (acknowledging reception in these areas)? What's the problem? I'm sure their trade bodies would be keen to co-operate, after all it's only a few bad apples? It would work in areas like the Peak District. Keeper Watching; the fascinating pursuit of observing the daily behavior of gamekeepers on moors, could really take off. How do we do that Andy these birds have been shown to fly up to 100 miles a day outside the breeding season. It is totally unpredictable where they will be they leave roost before full light and sometimes go to roost in the dark. its just not possible even with thousands of observers. And the first time the dark side knew we'd lost the bird it would probably die. Nothing underscores the reptilian arrogance and spite of the grouse shooting 'establishment' that, in the midst of a powerful national campaign to licence or ban their sport, they continue the illegal slaughter in such a brazen manner. Good too to see the RSPB is firmly pointing the finger not only at the culprits but the knowing apologists, little wonder they pulled out of the brood meddling nonsense. Didn't Mr Merricks promise to pull the H&OT out of the scheme too if persecution was demonstrated? At the very least all public grants to grouse shooting estates should be withdrawn until they can demonstrate that they have a healthy bird of prey population. Better still ban the sorry mess altogether. Increase in signings has just slowed to a dribble. I really hope this mornings surge was in memory of 'Elwood', but.....? Sorry Paul didn't scroll down far enough to see this when I was replying to "Against Feudalism" - with you on that! Nah, Paul - there is an issue with confirmations being sent out at the moment. Now showing 114,790 so has not been cut yet - perhaps a backlog of confirmations coming through explained the mini surge this morning? I signed another UK govt. petition just now and the confirmation came thru quickly, within a couple of minutes. Now 114,914 signatures and has crept back in to the top 3 at 95 signatures in the last hour. If there are more bot attacks can these be traced, e.g. through an IP address? Would they be reportable as Improper use of public electronic communications network ? "Section 127(2) targets false messages and persistent misuse intended to cause annoyance, inconvenience or needless anxiety... Section 127 can be used as an alternative offence to such crimes for example as ... hacking offences..."
Also Section 3 of Computer Misuse Act 1990 (Unauthorised acts with intent to impair operation of or prevent / hinder access to a computer) - http://www.cps.gov.uk/legal/a_to_c/computer_misuse_act_1990/index.html#an09 "Section 3 CMA should be considered in cases involving distributed denial of service attacks (DDoS)". I really would like to know why our lawmakers, judges, and the wildlife criminals, act with impunity when wildlife is involved. Is there a separate law in the United Kingdom for gamekeepers, and landowners. One which allows them to sneer at the lesser folk. It doesn't matter how hard the police arrest wrong doers if the judge throws the case out. If the people running the NGO's are luke warm in their condemnation, the criminals know they have beaten the good guys again. When oh when will the law get some teeth, and use it courageously. A big factor in the shooting lobby's approach - common throughout life - is that this is a tight tribe (birders are a bit the same !) where people simply don't socialise with anyone who disagrees with them. In shooting, its probably reinforced by a misplaced politeness and the fact that the employees (as opposed to owners/guests)are in an almost feudal position - not just in terms of employment, but in the small communities within which they live. And within those communities it is near certain that most people know what most of their neighbours are up to - that is certainly my personal experience of deep rural communities. It's very difficult to get out of the vicious circle - look at John Swift's experience with lead - and in my own world it's still possible to find a lot of foresters who can't understand why forestry backed off over the Flow Country in the 1980s. They still have jobs. If shooting doesn't do something pretty radical pretty soon to change the way it is doing things their people won't. I agree with much of what Roderick writes, we underestimate the continuity of feudalism. I think the other thing the regular loss of sat Tagged Hen Harriers and Golden Eagles shows along with there being virtually no successful Peregrines on any English grouse moors is that it is very clearly not a few "bad apples." That given opportunity most estates kill these birds, it may be that in any year only a few estates had the opportunity but the vast majority would have acted in the same way. Individual harriers or eagles are not unlucky in being on a bad apple estate, it is an inevitable consequence of them being on grouse moors.